Split down the dorsal side of the fish. Turn knife flat and cut from the tail to the head by running the edge of the knife along the backbone. 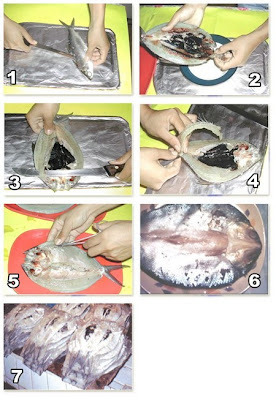 Lay fish open like a butterfly fillet. Then, remove gills and viscera. the blade along the backbone from head to tail. superficial slit along the dent of the dorsal muscles and pull out the intermuscular spines embedded between the muscles from the head to the tail. Remove spines in the ventral side in the same manner. Remove filamentous Y-shaped spines along the lateral lines, i.e., the junction of the dorsal and ventral muscles. Wash deboned bangus in clean water. Drain. Pack in plastic bags for storage in a freezer. Saan po nkakabili ng mosquito forceps?